The Clark County Courthouse is located at 501 East Court Street, Jeffersonville, IN 47130; phone: 812-285-6200. 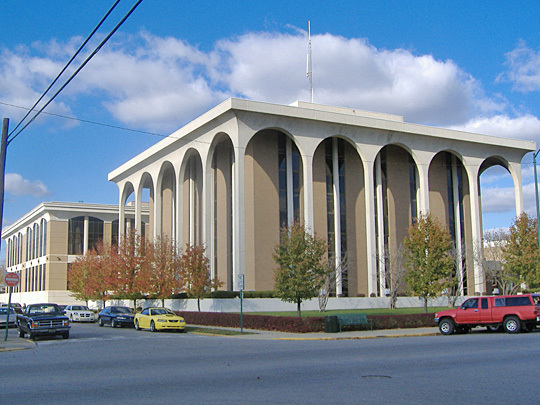 Photo: Clark County Courthouse, C. Bedford Crenshaw, photographer, 2008, en.wikipedia.org, accessed April, 2011. Located along the north bank of the Ohio River, across from Louisville Kentucky, Clark County was first settled around 1783. The county was created in 1801 with the county seat established at Springville. Jeffersonville was laid out the following year and the county seat was moved there. In 1810 the county seat was again moved, this time to Clarksville, remaining there until 1873 when Jeffersonville once again became the seat of government.